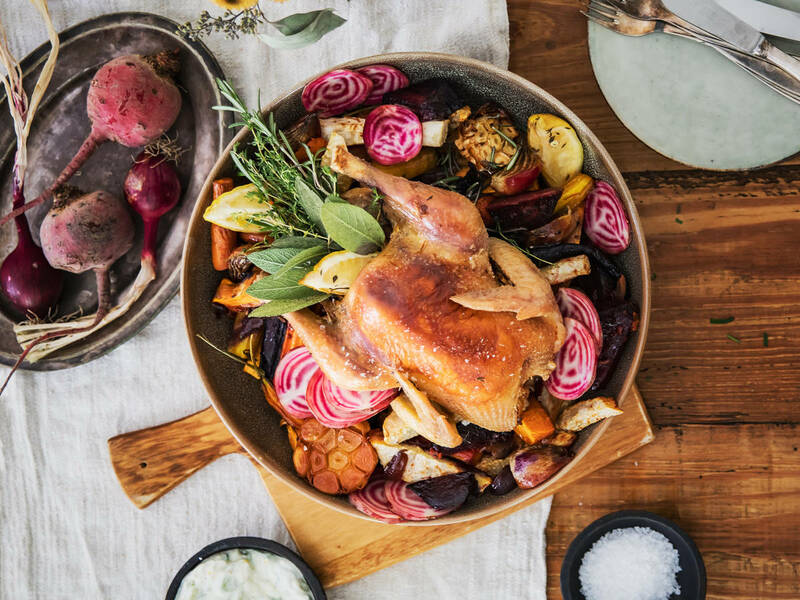 Weighing in as the second most widely eaten meat the world-over (just shy of pork), there’s no denying the popularity of chicken as a dinner plate protein, but even with the wide variety of cuts, techniques, and flavor profiles that chicken can accommodate, it’s easy to get stuck in the same old routine. If a simple chicken and broccoli stir-fry is your weeknight go-to and your only outlet for a switch up is a one-pan chicken dish—don’t worry, we’ve got your back. The simplest trick to lifting yourself out of a chicken dinner rut? Change up the cut! Whether your cut of choice is a boneless, skinless chicken breast or you’re a fan of the flavorful thigh, here are some general rules of thumb for preparing different chicken cuts—plus, our favorite, globally-inspired chicken recipes. Craving more information on various meat cuts? Find what you’re looking for in our in-depth meat cut guide. Purchasing a whole chicken has been said to be the cheaper, more sustainable option and no matter where you live, is that buying whole chicken gives you the power to decide if and how you butcher it. You can piece it out, spatchcock it, or keep it whole for roasting—making sure to save any giblets, bones, or offcuts (such as the back, neck, or wing tips) for homemade chicken stock. We tend to favor keeping whole chickens as they are and roasting them off for a simple, crisp-skinned and juicy centerpiece, but a hearty whole chicken stew suits us equally well. Chicken breasts are the classic cut of choice for a number of reasons. They’re easy to prepare (even more so when boneless and skinless), relatively quick cooking, and quite versatile cuts that which can be flattened and breaded, stuffed, or rolled, baked, cut up into chunks, simply pan fried, grilled, and even poached and shredded. Whatever cooking technique you choose, be careful not to overcook your chicken breasts— this is really the only mistake you can make when it comes to cooking this cut. Chicken thighs are definitely my personal favorite cut of chicken. Any recipe using whole chicken legs can be adapted to use just thighs, or just drumsticks. Keep them skin-on and fry, roast them, grill them, or braise them—I’m a big advocate for these dark meat cuts. Not often a part of the traditional dinner plate, as they’re often subjugated to the snack category, chicken wings are a fun cut. Grilled, baked, or fried, make a big batch of wings and a fresh, simple salad. If that’s not a switch-up on dinner, I’m not sure what is.